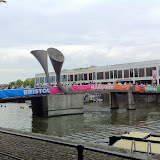 Michael was in Bristol this weekend, good timing for the 40th Bristol Harbour Festival. We spent Friday night at The Rogues Salute! which was night run by The Invisible Circus a themed street-performance theatre. For the festival they put together a pirate-themed evening, in a theatrical setting based on a port. Great sirens, chains to the wall, and drunken sailors, captains and pirates wandering about. Great fun! There were a few warm-up acts outside the big top, then the main evening event in the tent: a series of circus acts: hoop spinning, pole climbing, rope and cloth acrobatics and a talented tight-rope walker (with a pretty slack rope). The band (the Carny Villains) did a great sound track for the circus events, some of i more impressive than the activities on stage. After the circus events they did a series of numbers, and the whole event converted into a night club. Good nights entertainment, although I wished I’d remembered my sailor’s hat! We started Saturday with a tea and cake from the Sea Scout Hut below my house: good to see inside and there was a good historic display about the area. There was loads to see and do around the harbour, including a replica of Cabot’s ship, The Matthew. Our first event was hearing An Axe at the Louisiana Pub before lunch. Two of the band members are colleagues at IOP and it was fun to see them on stage. Good music. We had high-quality tapas lunch at The Olive Shed before taking a harbour cruise on the Pyronaut fire float built in 1934. The deck was very low (for zipping under bridges without lifting them to get to fires) so it made for a great platform to view the festival. Queens Square was packed, and not very pleasant, so we called it a day for the festival. Sunday was much more pleasant and we had a good wander around the market and food stalls. Interesting community gardening projects and build your own solar cells. We saw the Pyronaut with all water hoses blasting away.